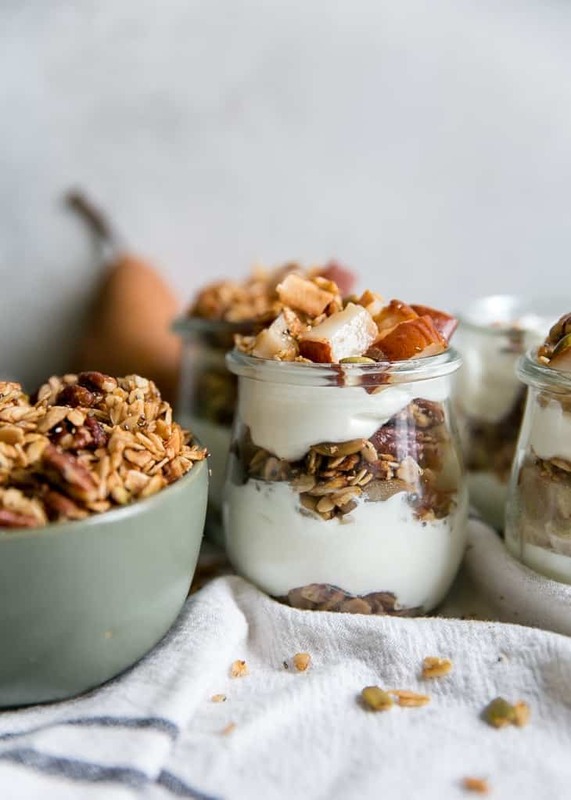 Add grilled pears into your yogurt parfaits with pecan cardamom granola layered in for a pretty make ahead breakfast for brunch item. This post is sponsored in partnership with USA Pears. As always, opinions expressed are my own. 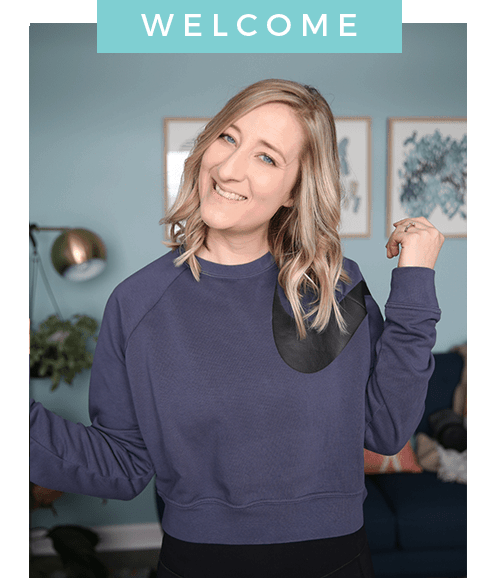 Thank you for supporting the brands that help Fit Mitten Kitchen bring you new recipes! New favorite breakfast, coming right up! I will forever love the yogurt and granola combination but we are taking things above and beyond by adding GRILLED PEARS to the mix. You guys. If you haven’t tried grilling pears yet oh em gee you must. The flavor and texture is amazing. It’s funny how just taking a tiny bit more time to prepare a dish and making it look pretty can affect our taste buds, isn’t it? Bosc Pears – in season September-April. 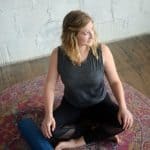 your favorite yogurt – Greek yogurt, Skyr, plant-based, etc. To Cluster or Not to Cluster – Normally I like granola with loads of clusters. But when making granola for parfaits I prefer the texture to be more like toasted muesli, if you will. If you do want clusters I share notes in the recipe page for how to achieve them – there are just a few modifications to make. Sugar + Oil – The granola is sweetened with maple syrup and the oil helps create a crispy texture. One of my other popular granola recipes uses part nut butter to replace most of the oil, if that is something you’re looking for. See here. 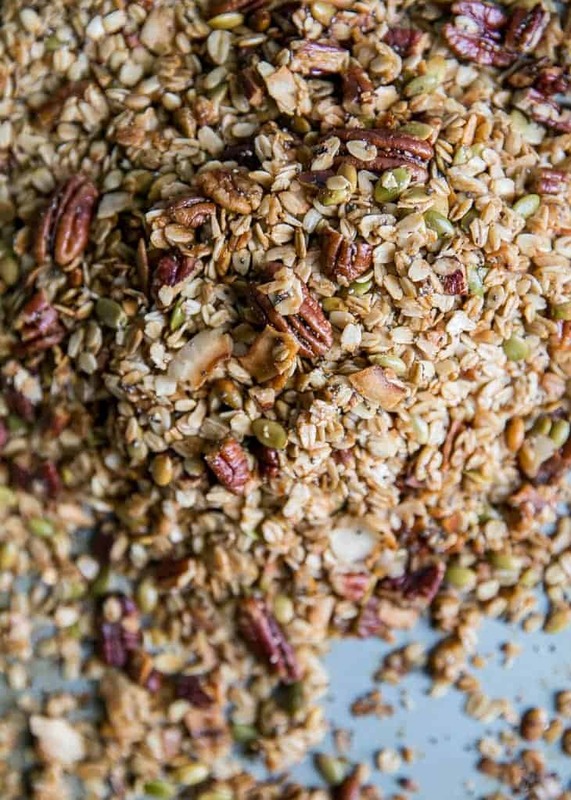 Nuts + Seeds – The pecans, pumpkin seeds and coconut flakes add great texture to the granola mix. You can also use almonds, sunflower seeds, omit the coconut if needed. Lots of ways to make this your own. 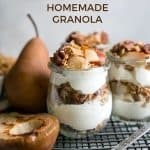 First start with the granola – this can be made while you cook the pears or it can be prepped well in advance (2-3 days even). It will take roughly an hour to fully cool once cooked. Grill the pears – To cook the pears use a grill pan, cast iron skillet or outdoor grill. Cut the pears in half and remove the seeds; lightly coat in oil and first grill cut side down for about 3-4 minutes. Then flip the pears and cook for another 2 minutes, or until just slightly softened but not mushy. Then dice them for the pear parfaits. 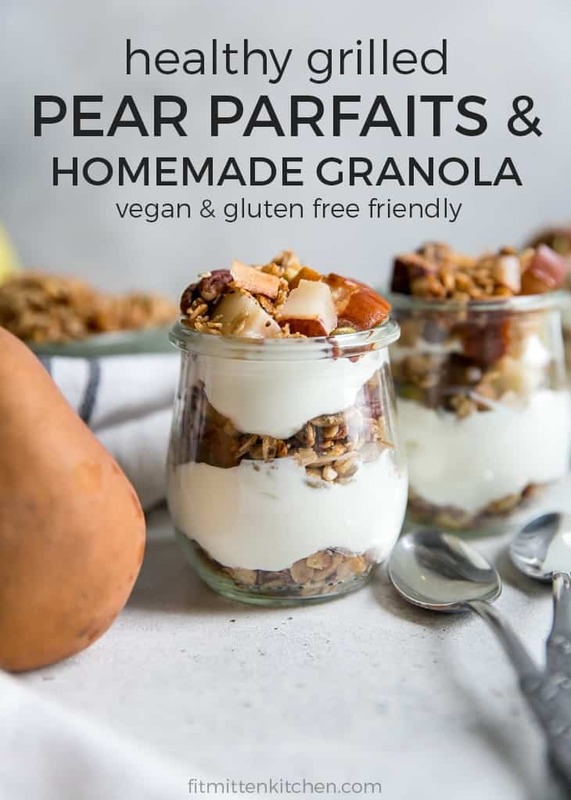 Assemble the pear parfaits –This will depend on what size jars you have (I used 8 tulip oz weck jars) but I like to begin the first layer with a couple tablespoons of granola, then add in about a 1″ layer of yogurt. Add diced grilled pears and granola. Then repeat this layering technique until you’ve reached the top of the jar. 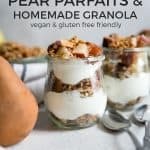 If you plan on eating the pear yogurt parfaits right away, you can go crazy filling to the top of the jar. If you’re prepping for 1-2 days in advance make sure you leave enough room for the lid to properly close. 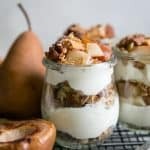 Of course there is always the option to just enjoy a good ole yogurt bowl topped with the diced pears and homemade granola – calling this recipe a pear parfait is just a fun way to make them look pretty. 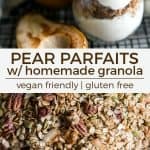 The combination of pears, granola and yogurt not only tastes amazing but also loaded with nutrients and a good mixture of healthy fats, complex carbohydrates and protein, making this one satisfying meal. Fiber – Pears are also a great source of fiber, which aids in satiety (feeling satisfied/full). Each medium-sized pear provides about 24% of the Daily Value for fiber. When you add fiber to your diet, the chance of needing to snack and take in more sugars goes down. “Recent research supported by Pear Bureau Northwest indicates that fresh pear consumers had a better nutrition profile when compared with consumers who didn’t eat fresh pears. For example, pear consumers ate more dietary fiber, vitamin C, copper, magnesium, and potassium. Fresh pear consumers also had lower intakes of added sugars, total fat, monounsaturated fat, and saturated fat (1). Fiber is an important preventive agent against many chronic diseases, and it plays a beneficial role in glucose metabolism and diabetes management (2). Dipayan Sarkar, Chandrakant Ankolekar, Marcia Pinto, Kalidas Shetty, Ph.D.: Dietary functional benefits of Bartlett and Starkrimson pears for potential management of hyperglycemia, hypertension and ulcer bacteria Helicobacter pylori while supporting beneficial probiotic bacterial response: Food Research International (2014). If you make this recipe, be sure to leave a comment and review here on the blog! I love seeing what you’ve made. Tag me @fitmittenkitchen and #fitmittenkitchen on Instagram if you take a picture! 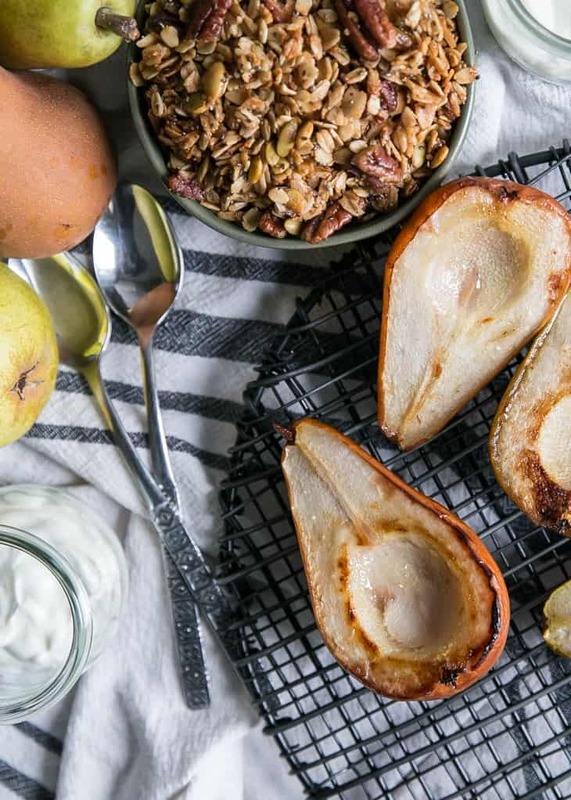 These grilled pear & yogurt parfaits make for a pretty breakfast and brunch menu item. Homemade cardamom spiced granola layered in for extra deliciousness. Gluten free and vegan friendly using your choice of yogurt. Preheat oven to 350ºF and line large baking sheet with parchment paper or silicone mat; set aside. In a large bowl stir together rolled oats, nuts, seeds, spices and chia seeds. Pour in oil, maple syrup and vanilla; stir until dry ingredients are well coated – use hands at the end if needed. Transfer mixture to lined pan and press flat. Bake for 15 minutes then check the granola and either stir if you want less chunks, or flip to keep some chunks. Continue baking another 5-8 minutes. Remove pan from oven and allow granola to cool completely (about 45 minutes to 1 hour) before stirring and removing from pan – the granola gets crunchier as it cools. To cook the pears use a grill pan, cast iron skillet or outdoor grill. Cut the pears in half and remove the seeds; lightly coat in oil and first grill cut side down for about 3-4 minutes. Then flip the pears and cook for another 2 minutes, or until just slightly softened but not mushy. Allow pears to cool before dicing into small chunks, about 1/2″. If you prefer more granola clusters, replace 2/3 of the rolled oats with quick oats. Use hands to mix the granola ingredients together at the end, and keep clumps while baking. Check granola halfway through baking time and *flip* the granola, don’t stir. Then make sure the granola cools completely. Here is another granola recipe that would work. Store completely cooled granola in airtight container. This should stay fresh and keep texture for about 2-3 weeks. 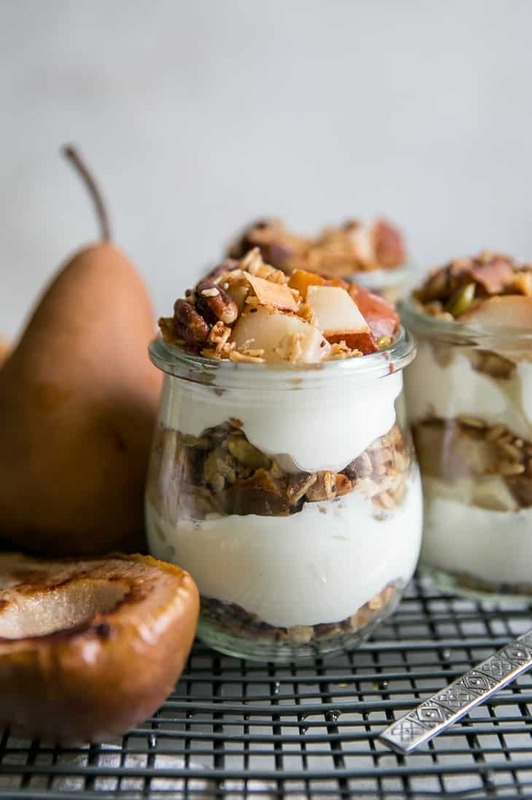 These pear yogurt parfaits can be prepped 1-2 days ahead of time.